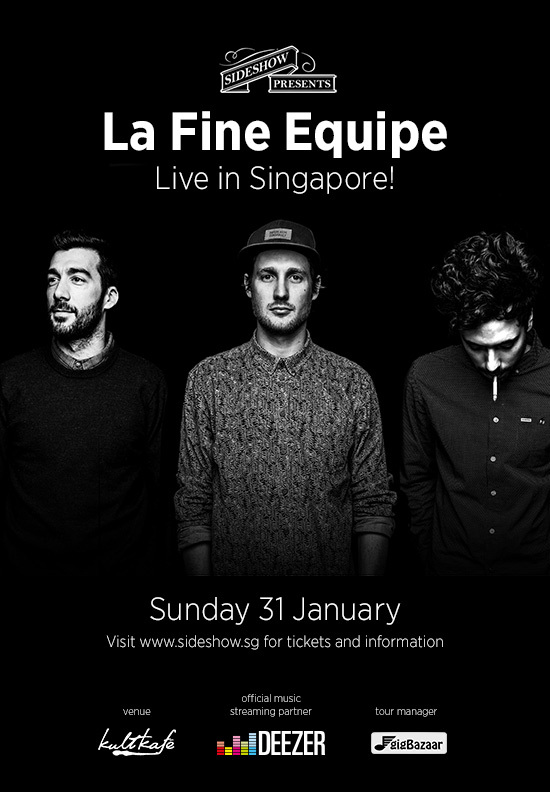 LA FINE EQUIPE – Live in Singapore! La Fine Equipe (LFE) are an electronic music act comprising beatmakers from Paris and Marseille: Blanka, Chomsk ‘, Mr Gib and Oogo. Albums include La Boulangerie 1, 2 & 3 compilations on Nowadays Records, Fantastic Planet, Gremlins EP and Lov For Eva. They have played some of the biggest festivals and venues including; Transmusicales de Rennes, Printemps de Bourges, Francofolies de La Rochelle, Dour Festival, and Montreux Jazz Festival. Their talent was also recognised when they were awarded the Deezer Adami VIP Prize in June 2015. LFE will be supported by Mr Assin (Beats From Beneath). Don’t miss this amazing electronic band – in Singapore for the first time! Promo code for Singjazz 2016!